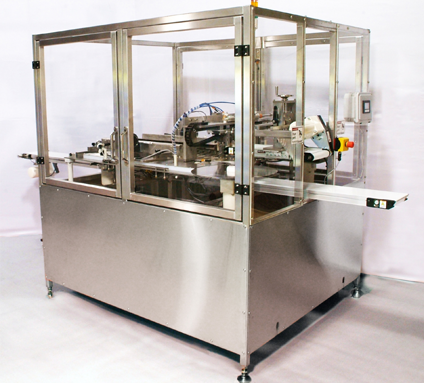 Optimize your tamper evident packaging process by eliminating preform shrink bands. Our new technology will cut your labor, freight and inventory costs by up to 70%. Don't settle for a tamper-resistant band when the eatSafe Ringer can create secure, tamper-evident seals. The eatSafe Ringer seals a variety of container sizes and shapes with minimal or no changeover time by using spooled film. Shapes include round, oval, rectangular, party platters and tins in a variety of sizes. eatSafe Ringer moves the manufacture of tamper-evident bands from half-way around the world to the point of use. The Ringer forms it to your unique package during manufacturing so that you don’t need to stock preforms for every variation. eatSafe Ringer reduces 6 of the 7 Wastes according to lean manufacturing practices. Labor Cost: eatSafe Ringer automatically places bands on containers, eliminating the need for labor in this process. Material / Film Cost: Save up to 70% on delivered material cost when compared to conventional preform shrink bands. Freight Cost: Eliminate huge freight bills associated with shipping pallets of multiple preform sizes from China. With eatSafe Ringer, one size fits all and is in stock, ready to ship from the USA. Shorter Lead Time: Materials are stocked on our floor, for Just-In-Time control of your inventory. Supply Interruptions: The changeover from one package size to another takes as little as 30 seconds on eatSafe Ringer, with no changed parts needed. eatSafe Ringer also runs random-sized containers of similar height with no changeover. Inventory Carrying Costs: Reduce your inventory by carrying ONE roll size which fits all containers. Receive inventory Just-In-Time for production. Obsolete Inventory: No more obsolete or aging inventory; with a one-size-fits-all product you have the perfect amount every time and no obsolescence. There are also many indirect cost savings when converting to the eatSafe Ringer system. Administrative Cost Savings: Eliminates the burden and headaches of managing, purchasing, tracking and warehousing dozens of preform sizes. Now you only need to manage one roll for all your needs. Warehouse Space: 95% less inventory space is occupied. Flexibility: Eliminate tooling costs associated with creating new preform sizes. Now, one size fits all your needs. Brand Your Products: eatSafe films can be printed to your specifications.